Accessories: Accompanied by Patek Philippe Certificate of Origin stamped by London retailer Wempe and dated October 8, 2016, Wempe invoice dated October 8, 2016, product literature, leather document holder, fitted presentation box and outer packaging. 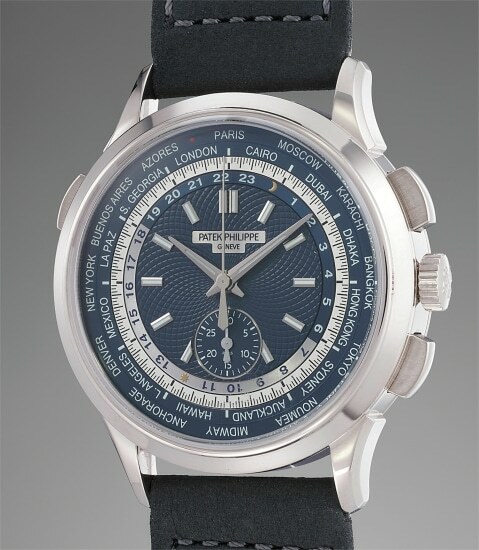 The world time complication is one of Patek Philippe's specialties. In fact, the company was one of the very first to adopt the 24-hour and city rings invented by watchmaker Louis Cottier starting from the early 1930s. Three vintage references were serially produced until the early 1960s, then no more world time wristwatch left Patek Philippe workshops until the 1990s. The reference was then rediscovered and has since been present in Patek Philippe catalogue and has carved itself a special place in the hearts of Patek Philippe collectors. One of Patek Philippe’s most fascinating vintage timepieces is a unique piece residing in the Patek Philippe museum: a yellow gold world time chronograph wristwatch. Following the footsteps of this historical reference, the company launched in 2016 the first serially produced world time wristwatch with an additional complication, as seen in the present reference 5930. Produced so far exclusively in white gold, it strikes the beholder with the elegant design of its dial. A discreet silver fixed ring with the chronograph fifth of a second divisions has been added between the mobile city and 24-hour rings, and the 30 minutes counter is placed at 6 o’ clock. In a final touch of sophistication, the central disc of the dial is decorated with a superbly executed guilloché pattern. Uniting the modern tradition of Patek Philippe and its most historical roots, reference 5930 is without a doubt a fascinating timepiece which will most probably be regarded as a landmark model for years to come.